18th-century calf, morocco on the spine, gilded titles on black morocco pieces. 2 volumes; Vol. 1: 233 leaves. Vol. 2: 226 leaves; the first pages of both volumes beautifully decorated (vol. 1 has a coat of arms (Cf. 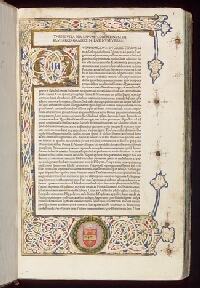 provenance); initial capitals in blue and red; occasional marginalia in a later hand throughout (more in vol. 2 than in vol. 1). Francesco Chieregati, Bishop of Teramo, 1478-1539 (fol. 1, coat of arms: PRO VIRBUS SUMMIS CONTENDO).